Free Book! If Mom’s Not Happy, Nobody’s Happy … Daniel Speraw’s MOM! 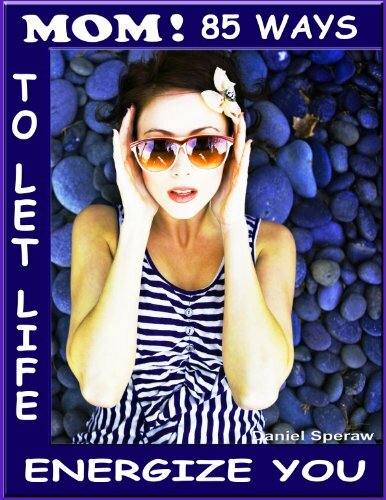 85 Ways To Let Life Energize You ((The Series: Things That Make Life Better)) – Free Today! You are the center of the family, Mom. You are the one who is most needed most often, and there may be times when you feel drained. Some Mothers reach the point where they have nothing left and still their families need them. Although you may never have felt that low, still you deserve to have your needs met—you deserve to feel recharged, feel more energetic and happier too. You deserve it not because of all that you do but simply because of who you are (no reasons needed). You deserve to feel cared for, feel pampered and yes, feel loved even more than you do. You think so too—at least a little—because here you are. So go ahead, use this unusual book to dash in, grab a goodie and fly on with your day. You can also use it to uplift and change your life—permanently. Curiosity may have killed that feline fur ball, but she or him learned a lot before exiting number nine. I too have been curious, wondering why we, I or they acted this way, looked or did it that way or were otherwise human.But curiosity is such a casual word, and the truth is my desire to know was almost desperate. There were times in life that I felt angry when there was no one around, unhappy when life was just fine, times I had trouble with relationships for absolutely no reason and felt sad when…well, you get the idea. That desperate curiosity, along with forty years of inner work, has lead to some interesting answers and some surprising books. I also love talking with courageous people who are going for a positive change, and I live to see that eye-widening moment of understanding–the kind of moments you will experience with these books.Besides curious and a good listener, I am also a writer who began with a column in the San Jose Mercury News, nationally syndicated. My current project is this series of books, five so far. So, from the Central Coast of the West, I submit these curious jottings of curiosity to be browsed by those who will hopefully find them as entertaining as they do just plain helpful.